A total of 2.4 crore candidates have applied for these vacancies making it one of the largest recruitment exercise in the world. Lakhs of youths will be appearing for Indian Railways's Assistant Loco Pilot and Technician exam in next few days. Due to a large number of applicants, many candidates have been assigned centres in 500 km of radius of their respective residences. To help candidates reach their exam centre on time, Indian Railways have been running exam special trains from the first exam which was held on August 9. The next sets of the exam will be held on August 14, 17, 20, 21, 29, 30 and 31. For the first time, question papers are being provided in 15 languages. Railways has announced that it will run four special trains today from Danapur and Barauni to Sikandarabad, from Darbhanga to Indore and from Muzaffarpur to Bhubaneswar. Presently two recruitment notifications- one for Assistant Loco Pilots (ALPs) and the other for Level-I (erstwhile group D) posts, for filling up about 1.2 lakh vacancies are under process. Train No. 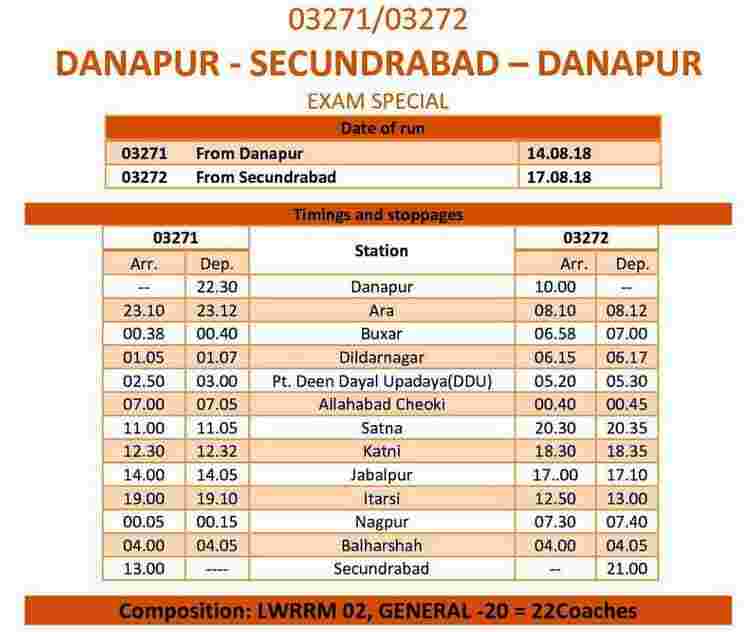 03271 Danapur – Secunderabad Exam Special Train will departed Danapur at 22:30 hrs on 14 th August, 2018 (Tuesday) and arrive Secunderabad at 13:00 hrs on the second day. In the return direction, Train No. 03272 Secunderabad – Danapur Exam Special Train will depart Secunderabad at 21:00 hrs on 17 th August, 2018 (Friday) and arrive Danapur at 10:00 hrs on the second day. 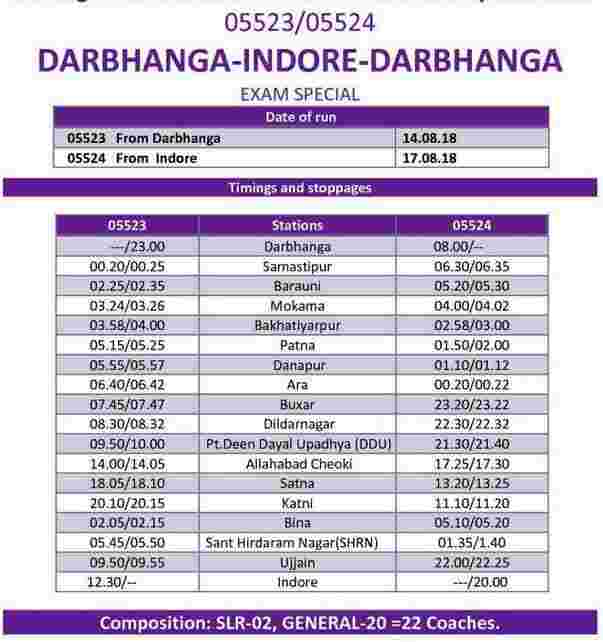 Enroute, these special trains will stop at Ara, Buxar, Didarnagar, Pt. Deen Dayal Upadaya (DDU), Allahabad Cheoki, Satna, Katni, Jabalpur, Itarsi, Nagpur and Balharshah stations in both the directions. These special trains will consist of General Second Class coaches. Train No. 05281 Barauni – Secunderabad Exam Special Train will depart Barauni at 16.30 hrs on 14 th August, 2018 (Tuesday) and arrive Secunderabad at 11.30 hrs on the second day. In the return direction, Train No. 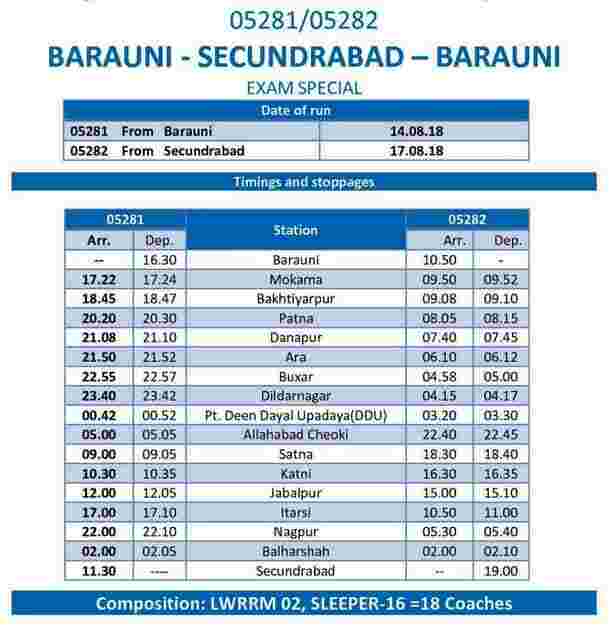 05282 Secunderabad - Barauni Exam Special Train will depart Secunderabad at 19.00 hrs on 17 th August, 2018 (Friday) and arrive Barauni at 10.50 hrs on the second day. Enroute, these special trains will stop at Mokama, Bakhityarpur, Patna, Danapur, Ara, Buxar, Dildarnagar, Pt.Deen Dayal Upadaya (DDU), Allahabad Chekor, Satna, Katni, Jabalpur, Itarsi, Nagpur and Balharshah stations in both the directions. 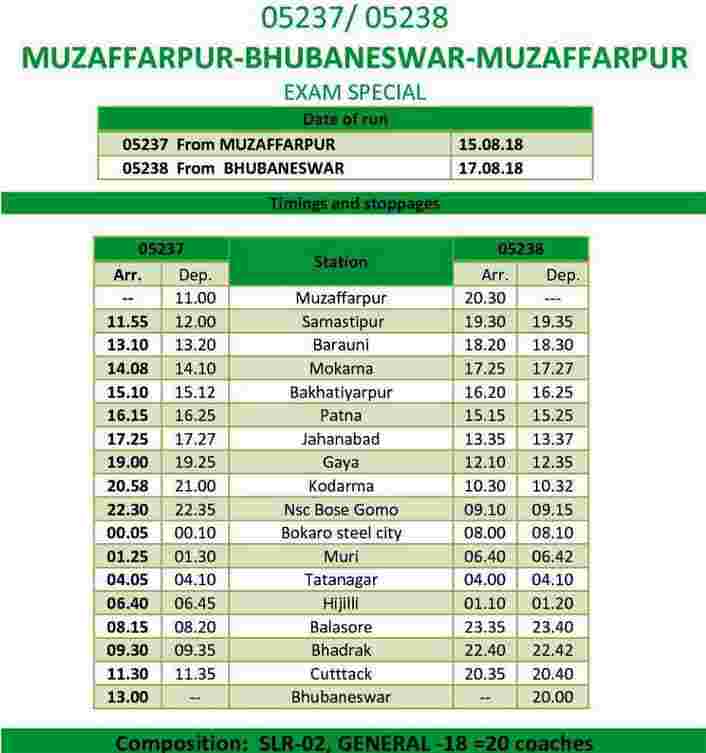 These special trains will consist of General Second Class coaches. 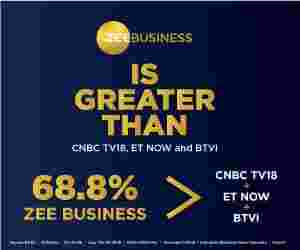 Enroute, these special trains will stop at Kazipet, Balharshah, Nagpur, Itarsi, Jabalpur, Satna, Manikpur, Allahabad Cheoki, Mughalsarai, Buxar, Ara, Danapur, Patna stations.